Consequent Technologies was a developer of server-side software technologies for the management of embedded products, founded in 2002, which was acquired by Intrinsyc Software in 2003. I had every intention of building Consequent into a major success story, along with my partners, Mike Lukas, Harold Gutovich and Greg Corcoran, but fate intervened in the early stages of developing and rolling out our first product for our first customer, Neoteric, and I was recruited back to the CEO position at Intrinsyc Software (see Intrinsyc Software - Overview & History) and along with this move, Consequent's assets were acquired by Intrinsyc. I believe that Consequent would have done very well with its business plan and motivated management team in place at that time and place in history. After I left my leadership position at Intrinsyc Software (for the first time) as its CEO in the fall of 2001, I continued to act as the Company's Chief Strategist and Chairman for a period of about a year before deciding to try my hand at another tech startup. I asked Mike Lukas to be my Consequent Technologies partner and co-founder, whom I had worked with years before at Integra Systems in the mid 1980s, and then later on at ERNEX/CSI Credit Systems (Mike was one of the founders of that company which I had helped build in 1992-1993 - click here for more info on ERNEX/CSI). Mike and I wrote the Consequent Technologies business plan (see below) and set out to build the business together, along with with Harold Gutovich as our VP of Sales and Marketing, and Greg Corcoran as our VP of Product Development (Greg was also a key player in the early days of Intrinsyc - click here for more info). I provided all of the seed working capital for the company initially, and later on we raised an additional amount of capital from a series A round from other private investors. We opened offices at Suite 1720 - 1066 West Georgia St, just down the street from Intrinsyc Software in downtown Vancouver, with an initial 2200 sq.ft of space, and Mike and I set about building and wiring up the offices, setting up all of the Ikea furniture (I built the whole reception console which ended up weighing 400 lbs in my garage), computers, servers, printers and phone system, while Harold provided great art work for the walls. We even had a beautiful etched glass corporate logo/sign mounted between our board room table area and the reception area. It was great space and designed for growth with more expansion space available next door to us. 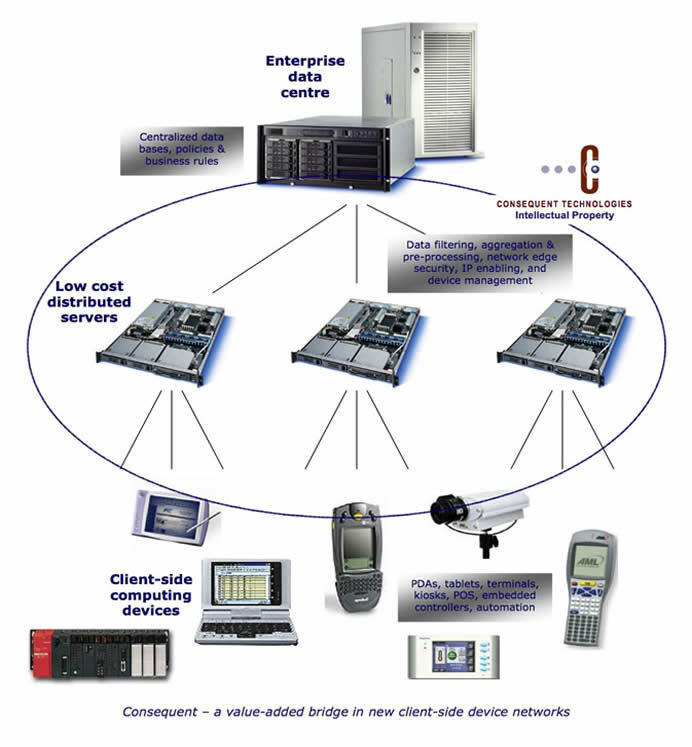 Consequent's mission was to be "a value-added bridge in new client-side device networks" by delivering low cost linux based distributed servers that performed data filtering, aggregation and pre-processing, network edge security, IP enabling, and device management. Consequent secured an initial customer via the signing of an agreement with Neoteric Technology Limited (www.neoterictech.com), which provides advanced patient and blood/drug product tracking solutions for more than 100 hospitals worldwide. Consequent was to provide the server-side device management and data capture/reporting solutions and act as an interface between the wireless devices and the hospital backend computer systems. Consequent had also engaged a number of other potential customers in similar applications (different industries) to provide device management and data capture/reporting solutions at the point in time that we sold the assets of the Company to Intrinsyc Software. As the founder and prior CEO of Intrinsyc Software, I always knew (and so did Mike, Harold, and Greg) that my fortunes, and to a degree, the fortunes of Consequent Technologies, would be tied in part to Intrinsyc's eventual success or failure. Part of that risk rested with our MOU with Intrinsyc to leverage its device remote management solutions which we were aiming to commercialize, in partnership with Intrinsyc, and part of it rested with the risk that if Intrinsyc's leadership imploded, I might be dragged back into Intrinsyc to help turn around the company. As it turned out, when the Intrinsyc board of directors dispatched Neil McDonnell, in March of 2003, they immediately called me at our Consequent offices, and then held a meeting in our board room, to talk about how I could be brought back to Intrinsyc on an interim basis to effect a corporate turn-around. After consultations with Mike, Harold and Greg, as well as with a few of our investors, Consequent itself agreed to provide leadership consulting services to Intrinsyc, for a limited period of time, to help with a corporate turn-around or divestiture of the Intrinsyc assets. Within weeks of my arrival back at Intrinsyc, on a part time/team basis, it became clear that it would be hard to leave the company within 6 months because the logical business plan was to re-build the business, not sell off its assets, and I was increasingly becoming a key leadership asset in that process. Intrinsyc's board set about proposing an offer to me to wind down the Consequent Technologies business and transfer the assets to Intrinsyc, which we agreed to do in the fall of 2003. Everyone at Consequent was offered employment and equity positions at Intrinsyc, with Mike instead asking for a buyout of his Consequent equity position, and then moving on to become an investor/owner and executive with Neoteric (our customer), and Harold accepting a sales management position at Intrinsyc. Greg also left to run his own company again. Needless to say, it was a tough decision to wind down Consequent, sell the assets and return to Intrinsyc as its CEO, and it was a decision that didn't win me any friends with my former Consequent team. We had created a great business plan and there was a solid future ahead of ourselves, and I cut it short, just as the business was about to take off. My experience with Intrinsyc Software after coming back was very intense and enriching, and it is hard to say what the better personal choice for me might have been, looking back with 20/20 vision. On the one hand I got to rescue my baby and build Intrinsyc a whole new exciting future by raising another $40M for it and development/commercializing its Soleus feature phone product (which is the largest investment that I know of that has ever been made in western Canada into a software product), but on the other hand Consequent was a clean sheet of paper that I held a controlling equity interest in and Intrinsyc's failure may have offered up new opportunities for Consequent out of its ashes. I do know that it was tough on my Consequent team members who put their trust and belief in me, and I still feel badly about that.